By definition religion is a force for social cohesion. 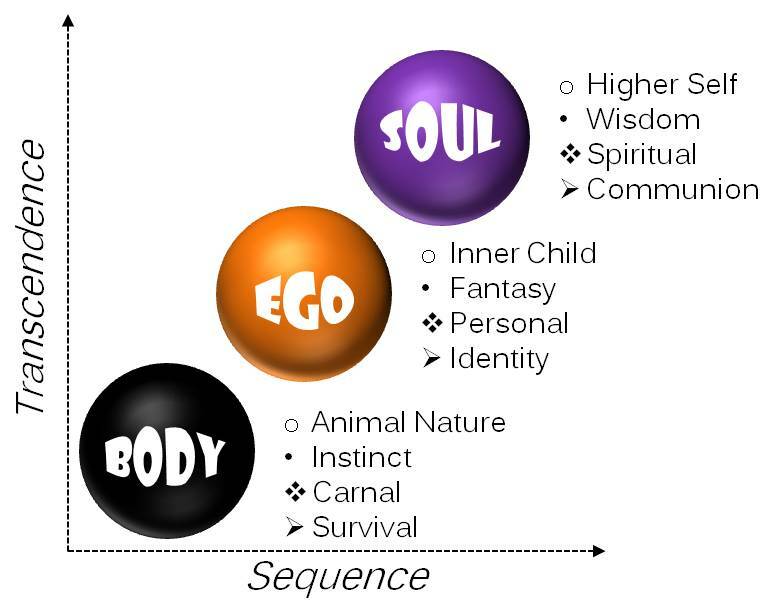 In “linking back” (religare) the many divergent concerns of daily life to a metaphor of ultimate reality, it provides a system of values and constraints that serves to hold a community together. This metaphor isn’t just a name for something already known objectively, but is the vehicle of language that first names the mystery and represents it, locating it amidst and beyond the necessary activities of everyday experience. It is what we call God. In this view, God (the unnamed mystery) isn’t something that comes to us from somewhere else, even if god (the metaphor) might well encourage the assumption. Whenever we talk about something, we understandably assume that there is some thing we’re talking about. Our talking about it makes this thing better known to our minds. By qualifying and explaining it, we are as it were throwing a net of definition around it and bringing it closer to us. The mystery with which religion is (or at least originally was) chiefly concerned, however, is not a mysterious object to be explained and thereby rendered meaningful. It is rather the deep support and radiant presence of reality felt in the providential uplift of conscious being, of life in this moment. The God-metaphor, then, or what I simply refer to as “god” (with a lowercase ‘g’), is a product of our imagination, a reflex of the mind to put labels on reality, push it into the distance where we can regard it as “this” or “that,” and then grasp it as an object of understanding. As metaphor (from meta + phorein, to carry across), our representation of God facilitates the experience of mystery across the threshold and into the web of language, where it can be expressed as meaning. Further articulation of meaning is accomplished through the media of art and story, where the metaphor takes on dimension and weight, opening up various ritual ways for us to link daily life back to the present mystery of reality. So now we can add to our starting definition of religion as the link-back of everyday concerns to a metaphor of ultimate reality, by saying that this is primarily a ritual (ceremonial, sacramental, liturgical) system of social behaviors. In coordinating tribal life in this fashion around a metaphorical representation of the present mystery, social cohesion is successfully maintained. And because it is designed to bring individuals into agreement over their shared identity and specialized responsibilities to the group, I will call this form of religion “conventional theism” (from theos, god with a lowercase ‘g’). It’s been around for many, many thousands of years, and is still the dominant form of religion in our day. The illustration above provides a way of understanding conventional theism as coordinating the hearts and minds of individuals, and individuals with the larger group, around the orthodox representation of God (or god). 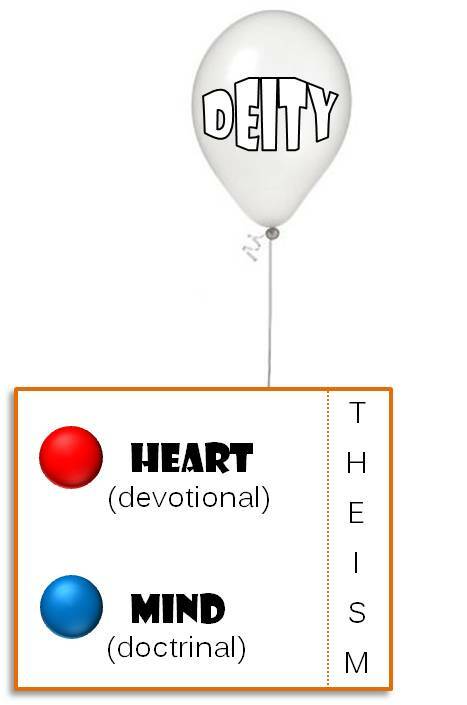 I don’t mean for the balloon with the word “deity” imprinted on it to be taken as a lampoon, but merely to pick up on the point made earlier, that god arises out of the metaphorical imagination and is eventually (if it gains widespread agreement) tethered to the frame of community life as the focus of worship and belief. Insofar as the deity is made in our image – that is to say, in a way that reflects back to us the personality traits, character strengths, and waking virtues of our own higher nature – it serves to inspire us to life above our animal instincts and juvenile impulses. As we contemplate in our minds and glorify with our hearts this chosen metaphor of God, it represents to us a better part of ourselves that is to some extent still in our developmental future. Yahweh’s career across the time arc of the Bible demonstrates this dynamic perfectly, beginning as a warrior deity to a band of near-eastern nomadic tribes; taking his place as Lord and Creator in the era of national settlement; reaching out in compassion to the poor and marginalized during the downfall of King David’s dynasty; and resolving at last – around the time of Jesus but most clearly in the life and teaching of the Nazarene – to lift the curse of guilt from his enemies by a unilateral and unconditional forgiveness. If you should put early-Yahweh and late-Yahweh side by side, you would have to conclude that the two were different gods – so great was the evolutionary distance traveled by his community of faith over the course of centuries. Such an evolutionary view of religion, tracking the developing metaphor of God as a reflection of our spiritual awakening and moral progress in community, must beg the question: Does a time come when the metaphor has served its purpose and is no longer needed? Are there more “mature” approaches to the mystery and our own life adventure, which could help religion stay current with our evolving spirituality? I suggest there are, and even now some forms of conventional theism are beginning to invite these voices of what I call “edge religion” into the conversation. And so I will make yet another appeal on behalf of post-theism – not as an alternative to theism, but rather its natural fulfillment as a system for social cohesion and spiritual guidance. By definition, post-theism explores the frontiers of faith development “outside the box” of conventional religion, but without abandoning the box and trashing its patron deity. The structural support and moral orientation provided by conventional theism is, I will argue, still important and necessary to the formation of faith as individuals (especially the very young) are in the process of having their identities constructed in community with others. But there comes a time when, for many, the conventional representation of God becomes too small, too confined by doctrines, and increasingly irrelevant to daily life. These are folks who typically begin asking questions and challenging the usual answers inside the box. They are searching for a spiritually grounded way of being in the world, one that can help them continue to evolve in their faith. They aren’t interested in disputing the existence of god, and more of them today are refusing to be converted back to the religion of their youth. Consequently they wander outside the box foraging for spiritual sustenance, sometimes feeling guilty for wanting more (or something else), and often struggling with the loneliness of no longer having a community. But there is hope. As I said, some theistic religions and denominations are providing space for these “edge dwellers” – and they have something of great value to contribute. Basically they come in two varieties, and it’s not unusual to find both strains of post-theism in the same individual. They represent the mystical and ethical edges of conventional religion, although they have no interest in merely recovering that familiar warm feeling in worship or sifting through the commentaries of church doctrine. They bring tools. 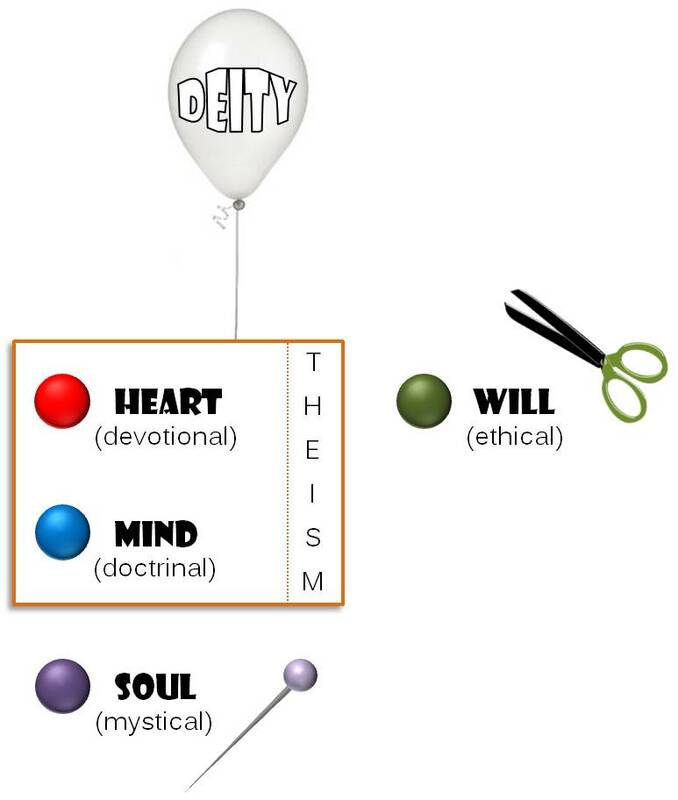 Let’s recall the significance of that balloon tethered to the frame of conventional theism. It is the preferred metaphor of God, the orthodox representation of the present mystery within and all around us. It calls to us – reminding us of who we are, where we belong, how we should behave, and why we are here. But when (not if) the individual’s spiritual capacity and depth of experience is no longer promoted by the god we all know, something needs to be done with that balloon. Those post-theists who are mystically oriented wield the tool of a straight pin. They help us to realize – on the likely chance we have forgotten – that our representations of God are constructs of our minds, a convenience of language in providing handles on reality. These metaphors are not simply labels affixed to a literal being “out there” and separate from us, but rather spring from the inner life of the soul where we rest in the provident mystery of Life itself. Popping the balloon is not intended as sacrilege or “atheism”; it is what’s required if we are to experience the ineffable presence, the unnamed and unnameable ground of Being. Ethically oriented post-theists are often motivated out of a concern that the so-called “will of God” has become too predictable, too much an endorsement of our petty ambitions and self-serving moralities. They bring scissors. By snipping the balloon string, these revolutionaries want to return freedom, unbounded generosity, and creative license to our metaphor of God, which means that we need to release our patron deity into the infinite sky, into the God beyond god. Only when God is no longer “our god” will religion be able to reach out to the stranger, love the enemy, and include everyone without judgment but rather in celebration of community. We will never be without religion. However religion will be without more and more of us until it welcomes those on the edge and listens to what they have to say.